The Authority envisions a vibrant, progressive, and self-sustaining destination that is connected with the community and the greater Atlanta region. Bring a broad spectrum of jobs, wages and capital investment to our community. Increase the desirability of the Fort McPherson property as a vibrant, progressive and self-sustaining destination. Craft our story to connect the rich history of Fort McPherson to the vibrant future of this property. Connect with our partners and leverage our collective resources to uplift our community. Honor and uphold our commitments to our community and the government. Build a robust organizational structure of people and processes to drive performance excellence. The Base Closure and Realignment Commission (BRAC) voted to close Fort McPherson, and formed the nonprofit corporation McPherson Planning Local Redevelopment Authority, Inc. (MPLRA) to plan the reuse and economic development of the post on behalf of the Cities of Atlanta and East Point, and Fulton County, Georgia. 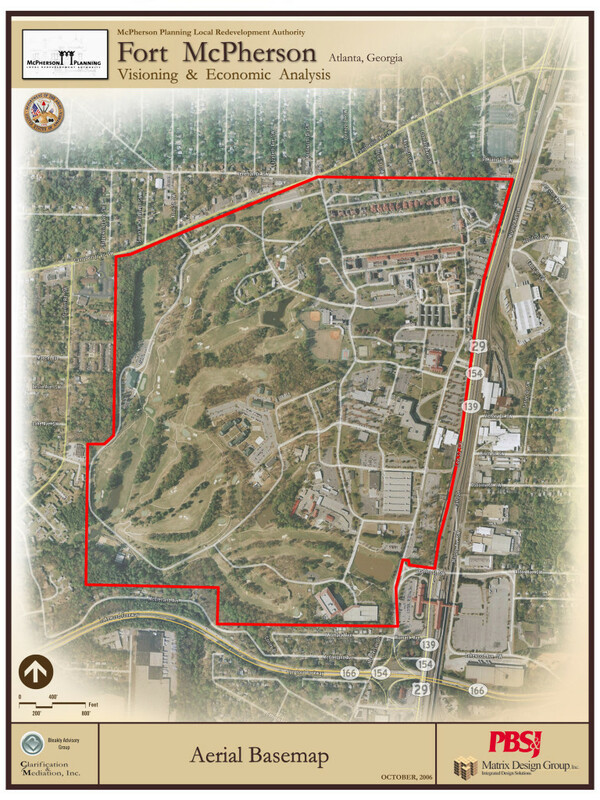 MPLRA unanimously approved a Reuse Plan for Fort McPherson – a concept for a mixed-use, transit-oriented, walkable community anchored by a 127-acre Science and Technology Park. MPLRA engaged leaders in the health care industry as well as Emory University, Georgia Tech, the Centers for Disease Control, the Mayo Clinic and Grady Health who supported the concept of developing a research park at Fort McPherson, but none were able to support such a development financially. The United States suffered a financial crisis, beginning the Great Recession. Real estate, in particular, was badly impacted by the economic downturn as both debt and equity financing became difficult to obtain. 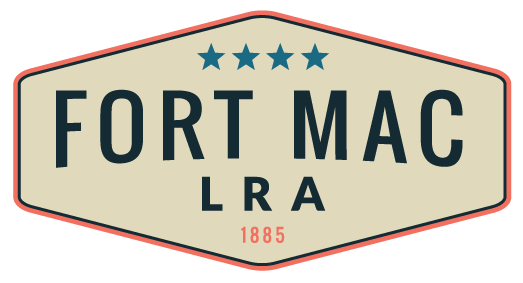 Fort Mac LRA updated the Master Plan with significant input from the surrounding communities and made adjustments to the plan based on market realities. It also initiated a five-year update to the Oakland City/Lakewood Livable Centers Initiative study. With intensive community engagement, these updates identified new developments, listed infrastructure upgrades, drafted zoning and land use regulations for Fort McPherson and listed special public interest districts. In order for the Army to consider an Economic Development Conveyance (EDC), the Army requested that Fort Mac LRA engage a Master Developer through the Request for Qualifications (RFQ) process. Fort Mac LRA received RFQ bids from two teams and pursued the bid selected by the Board of Directors, conducting negotiations throughout the year. Based on a lack of market support for a science/biotechnology research park at Fort McPherson, the potential developer would require developer fees. Likewise, Fort Mac LRA would require the developer to cover certain administrative costs necessary to fulfill obligations to the Army and the community. The selected developer advised Fort Mac LRA that they were no longer interested in developing Fort McPherson. The Army adjusted terms to require guaranteed payment on 100% of the purchase price, eliminating the option for a mortgage. Since the alternate RFQ submitter was no longer interested in the project, there were now only two options: 1) taxpayers fund the $26 million purchase, or 2) Fort Mac LRA identifies a private investor to purchase enough acreage to enable Fort Mac LRA to meet the Army’s financial requirements. Atlanta Mayor Kasim Reed introduced Tyler Perry Studios (TPS) to Fort Mac LRA as a potential investor. Soon, Fort Mac LRA and TPS were negotiating a transaction that would allow the simultaneous purchase of the full 445 acres from the Army and sale of 330 acres to Tyler Perry Studios for construction of a film studio. With an anchor tenant secured, Fort Mac LRA began to develop plans to implement as much of the Master Plan as possible on the 145 acres retained after sale. Fort Mac LRA, Tyler Perry Studios and the Army finalized an agreement on the sale of Fort McPherson. Fort Mac LRA became the owner of 145 acres for reuse and redevelopment, and commissioned a study by a Technical Assistance Panel from the Urban Land Institute, as well as a study by the Oakland City/Lakewood Livable Centers Initiative.